Ouch! I hate taxes. But I have to admit, I enjoy many of the privileges and blessings that those taxes afford. Paul reminds us in Romans 13, that civil authorities are God's tools to hold back anarchy, chaos, and lawlessness. As a Christian, I'm immune to most laws because my faith in Jesus is going to regulate my behavior far more strictly than a legal code. 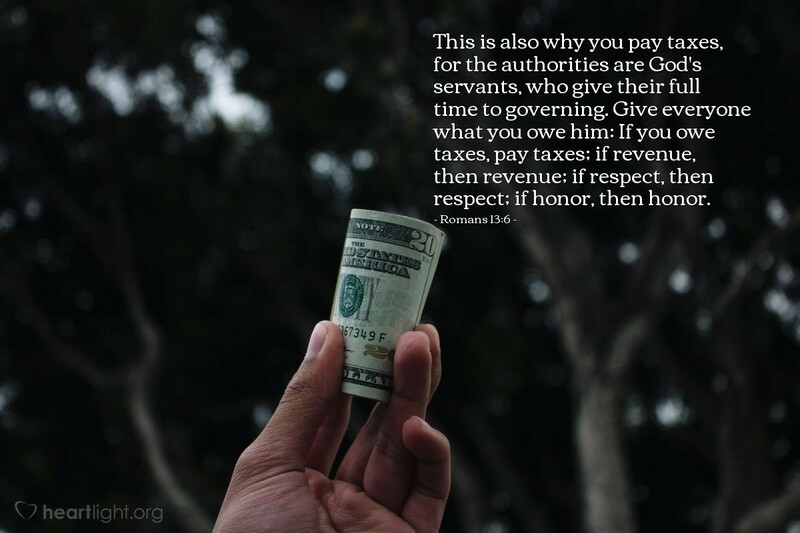 But I do have a responsibility (I "owe" it, Paul says) to be a good citizen, a good financial manager, a nice respectful neighbor, and a person who willingly honors those who have merited it. Almighty God, I pledge my allegiance to you. You alone are Sovereign, Ruler, and King. But because you call me to honor my government, because you have so richly blessed me to be in a land such as this, because you have lavished your grace on me so richly, I commit to live today in a way that honors my allegiance to you, my citizenship in my country, and my respect toward those whom I meet this day. In Jesus' name I pray. Amen.